He may not exactly fall into the bambino category any longer but he'll always be mine... 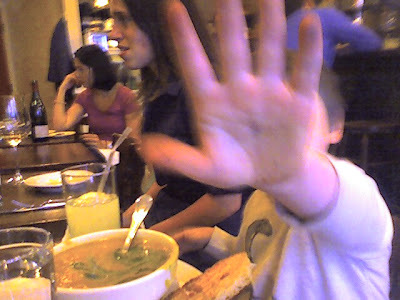 Even as he waves away the papparazzi! A long afternoon at pottery class and Izzy works up quite an appetite. My friend R. decided that 'Ino , just a sliver of a panini bar, tucked away on Bedford Street would be a good place to fill his belly. There is not much wiggle room inside so it is truly for the well-behaved bambini. The menu is filled with bruschette, panini, salads and other authentic Italian wine bar fare. It is the perfect spot for a glass of wine and an appetizer or for a light meal. That being said, we managed to eat enough for dinner, Izzy saving just enough room for a cannoli on the way home. Izzy had a smooth root vegetable soup and we shared a bresaola,asparagus and pecorino panino. I had an arugula and Jerusalem artichoke salad and my friend R. had an awfully piggy tasting sopressata and arugula panino. 'Ino is definitely a pleasurable place to stop, whether for a quick drink and a bite to eat or a lengthier meal. It is also situated on a street dotted with all sorts of offerings so you could make a grazing evening of it as well. Along Bedford Street a few places I spotted were Blue Ribbon, Chez Henri and Ditch Plains. I think I might just find myself wandering in that direction more frequently. Angela: What do the older ones eat now? How old are they? It's never too late to help change them! I checked out your blog and see you are into raw milk too. Where do you live? I miss New York! And I've missed your blog . . . it's good to be back! Milk and Honey: The Best Medicine? My Passover Baby: A Birthday Glitch? "I Don't Like Chicken And I Don't Like You"
Turning Into A Pizza, Who Me?